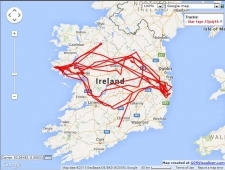 On 1 April 2015 the mate of our satellite tagged White-tailea Eagle male Star was found dead on the nest in Connemara. Tragically she was on the point of egg-laying but was found poisoned by local conservation ranger Dermot Breen (see [previous blog). White-tailed Eagles usually pair for life and take some time to get over the loss of a long-term mate. Indeed we have seen how parents seem to “mourn” the loss of a chick by spending days close to the nest as a pair, often calling for long periods (excuse the anthropomorphism but it’s hard to describe some eagle behaviour without using human terminology!). 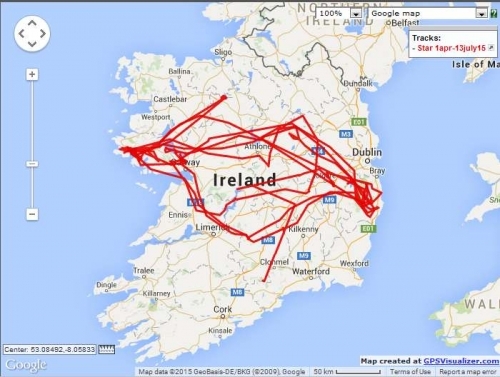 Well after spending the next week around the nest site in Connemara after the loss of his mate, Star headed off on a trek across Ireland, leaving on 6 Apr for the Longford-Westmeath border. Next day he headed south into Laois, west to the Tipp shore of Lough Derg, passing by the Mountshannon eagle nest site on 9/4 before roosting SW on Slieve Bernagh, Co. Clare. Next day he made it back to Connemara. ON 16/4 Star repeated the trip east to Roscommon before heading SE to Redcross, Wicklow nest day, west into Offaly on 18/4 and back to Connemara next day. Not hanging about Star headed SE to N Tipp on 20/4, then into Kilkenny and on east to roost in the Wicklow Mts on 23/4, Blessington on 24/4, west into Offaly on 25/4, south to the Knockmeldown Mts on the Tipp-Waterford border on 26/4, returning to Connemara by the 30/4. On 5/5 Star headed east again to the shore of lough Corrib, then south to the Silvermines in north Co. Limerick on 8/5, NE to Glenealy, Co Wicklow (again!) on 9/5, NW to Blessington next day and back to Glenealy on 11/5. Star headed back west into Co. Galway on 13/4, and back to the Corrib next day. Star remained on the Corrib for the next two weeks before heading easy again on 28/5 to Lough Ree, then east to Redcross, Co. Wicklow on 29/5, NW to Lough Owel, Westmeath, on 30/5, Derravaragh on 1/6, back to Lough Ree on 3/6, then NW to Lough Gara on the Sligo-Roscommon border on 9/6, before finally returning to his nest site in Connemara on 14/6. On 26/6 Star headed back NE to north Roscommon where he has been more or less resident over the last 2-3 weeks. Will Star return to Connemara or perhaps the Corrib and find a new mate before the 2016 breeding season? Losing a mate can result in the loss of a breeding pair and the desertion of former breeding territories. It would be tragic to think that Star might fail to find a mate. Let’s hope he isn’t a loner for too long!